Fluffy protein pancakes topped with amazing blueberry sauce and Greek yogurt. 1. Heat a small pan over medium-high heat. 2. Add blueberries and 1tbsp water and heat until water begins to boil, then mash blueberries with a wooden spoon. Add Truvia and continue to boil for about 3 minutes or until sauce thickens. Set aside. 3. In a Nutribullet or food processor, mill 1/3 cup rolled oats until they are a flour-like consistency. In a small bowl, combine oats, flax seed and protein powder. 4. Whisk egg whites until they are slightly frothy. Add to oat mixture, then add applesauce and vanilla. Stir until smooth. 5. Heat a skillet or griddle over medium-low heat. Spray with non-stick cooking spray and spoon pancake mixture onto skillet to form small pancakes (about 4-5" in diameter). Cook until top begins to bubble or bottom of pancake is golden brown, about 1 to 2 minutes, then flip and cook other side. 6. 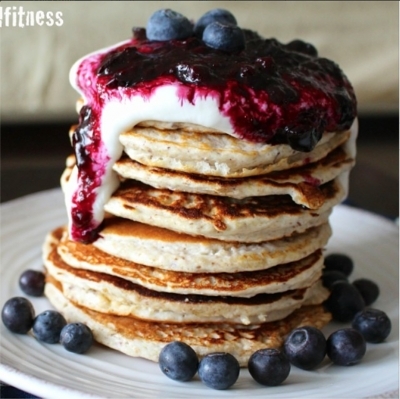 Top pancakes with 2 tbsp Greek yogurt and blueberry sauce.